Charles Salagnad made this drawing in 1872, during a phase of renovations at the now-famous Newport mansion, Château-sur-Mer. The house was built two decades earlier for the wealthy China trader William Shepard Wetmore (1801-1862). Wetmore’s newly married son, George Peabody Wetmore, commissioned one of Gilded Age society’s preferred architects, Richard Morris Hunt, to transform his late father’s home into the opulent structure we know today. Along with structural changes, George also initiated a program of interior decoration. The adornment of the three-story staircase, seen here as one of six drawings relating to the project in the Cooper Hewitt’s collection, was just one part. 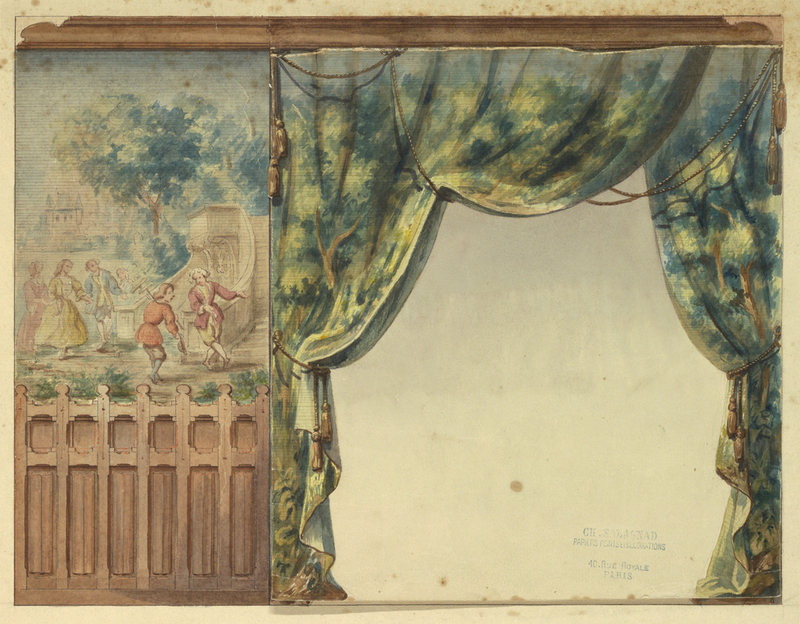 In the drawing, Salagnad depicts a carved wooden dado (lower) wall, surmounted by a panel filled with jewel-toned greens and blues. The figures in the panel are wearing eighteenth-century clothing, recalling the decoration of older, aristocratic European country houses. Alongside the wall is a swathe of drapery that appears to depict trees or foliage. Together, the colors from the painting, drapery, and woodwork create a lushly textured atmosphere. With the curtains were closed, these dark colors would have been a potent counterbalance to the sun’s rays. The attention Salagnad gives to this space, probably one of the landings, is indicative of the important role that decoration played in every part of a grand home at this time.